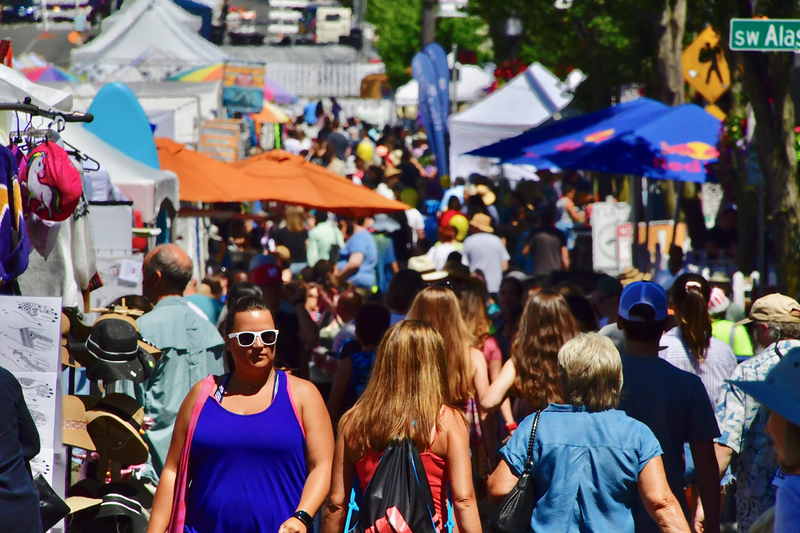 Temperatures in the mid to high 80's brought out big crowds to sample the booths, walk their dogs, enjoy street food, and of course listen to the music lineup at West Seattle Summerfest on Friday July 13. Shady spots were filled at temperatures reached the mid to high 80's (with higher temps forecast) at West Seattle's annual street party Summerfest, on July 13. The event annually draws tens of thousands and Friday was a big day for attendance. The Greenlife Stage on Alaska Street featured environmental activist, diver and filmmaker Laura James and The Tox-Ick Monster presentation. Coming up Saturday Greenlife will offer an array of potential options for activism. Saturday July 15th – Legislative Action! 7:00pm- Free Movie at the Senior Center Damnation, about the removal of the Elwha Dam and the freeing of wild rivers. On the Main stage Friday Versing impressed the crowd with a laconic attitude and powerful pop music. Closing out the night were The Briefs whose punk energy remains undimmed. West Seattle's Brent Amaker said "I'm a superfan. These guys are huge in Europe and have a big following over there. It's the songs, the energy, the attitude and the performance... everything." The band did not disappoint with their frenetic performance style prompting stage diving and a bouncing, dancing crowd surging to the stage. The festival continues through Sunday at 5pm.